I dislike writing anything about him, for even the tiniest amount of publicity for The Supreme Asshat is far too much. But Minnesota's Sideshow Freak, Gary Kellior, wrote one of his most pathetic columns recently. Keillior is a very wealthy man, who has every amenity that life offers - yet he remains bitter and unhappy. I have to think he has some form of severe retardation and I don't mean that in a humorous way. Or maybe he's just one of those bitter Liberals that we're always hearing about. Gary The Freak must have missed the many stories - like this one - about those "innocent Gitmo people" who are released only to return to a life terrorism . Well, he probably didn't miss any of the stories like that - he ignores them because they interfere with his Liberal Bias. What good is being hypocrite when one allows facts to get in the way of what they believe, right? Tell that to the families who lost love ones on September 11, Gary. See if they're laughing. Get back to us on it, would you, El Freako? We'll see how lame a joke terrorism is when we experience another domestic attack should either Hillary Clinton or The Illinois Muslim get the keys to the White House. We'll laugh all the way to the funeral service and the burial at the cemetery. Here is the completely, totally, ironic part of Gary The Elitist: It appears Gary does not consider terrorists or terrorism a threat. Gary is a tough guy, a real HE-Man. 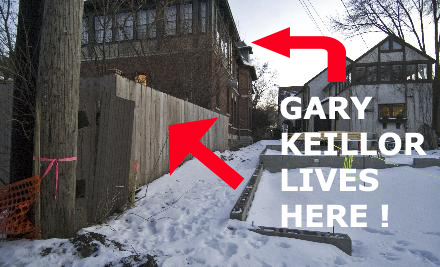 Yet, Gary is frightened by a garage being built by his neighbors. I guess Gary is more afraid of an inanimate object, like a building, than he is any terrorist. Gary is petrified not of terrorists, but of his fan base, obtaining a restraining order against one of his fans. It is unfortunate that Gary or someone in his family weren't on one of those airplanes or in the World Trade Center buildings or the Pentagon on September 11. People like Gary are only affected by tragedy when it directly affects them. And then it becomes, "all about them." Gary feigns bravery in the face of terrorists who haven't affected his life. But he cowers like a little boy hiding behind his Mother's apron, scared to death of a garage and a fan. He's so brave! So fearless! So heroic! Gary lives in a large brick house in St. Paul, Minnesota's Ramsey Hill district. His house is easy to recognize. If you're one of those "innocent persons" recently released from Gitmo, stop on by and pay him a visit. He'll welcome you with open arms, a cup of coffee and a gourmet muffin. Just don't plan on building a garage by Castle Kellior if you're his neighbor or be one of his fans. Those are the people who really terrify him. Use of the above photographs complies with Fair Use Section 107 U.S. Copyright Code, for use of news reporting, commentary and criticism.